We have a large range of high quality, dip treated and pressure treated 6ft fence panels and fencing accessories for easy and secure installation. Our superior choice of garden fence panels will help keep your outdoor space private and protected whilst looking great. Mr D J from Farnham, Surrey, said; "Good quality fencing, sturdy and built to last. This is the second time I have ordered this type of fencing and have been pleased with the great service from start to finish. I would recommend Waltons every time". This fence panel is 6' 0" (1.83m) x 6' 0" (1.83m) (HxW). This 6' x '6 Dip Treated Waney Edge Fence Panel will add the finishing touches to any garden. This fence is constructed using robust materials that will create a private and secure border. This fence panel is 5' 0" (1.50m)H x 6' 0" (1.83m)W.
Perfect for cordoning off vegetables patches, this Dip Treated Waney Edge Fence Panel offers a robust build that can be used for a variety of purposes. This fence panel is 4' 0" (1.20m)H x 6' 0" (1.83m)W.
Our Waney Edge Fence Panel is perfect if you're looking for a versatile fence that will look great in any style of garden. This wooden panel is ideal for creating a secure border that isn’t overbearing on the rest of the garden. This fence panel measures 3' 0" (0.91m) H x 6' 0" (1.83m) W.
This wooden rough sawn Picket Rounded Top Garden Fence Panel is perfect for creating a charming border around the edge of the garden that isn’t too overbearing. This fence panel measures 5' 0" (1.50m)H x 6' 0" (1.83m)W.
Create a robust and timeless fencing row in your garden with this Pressure Treated Feather Edge Wooden Fencing Panel. This great value for money fencing will create an excellent border in any garden. 3ft x 6ft (HxW) Waltons Lap Garden Fence Panels. We supply wooden garden fencing and fence panels in a variety of styles. FREE UK Delivery. Perfect for creating an attractive and secure border around the edge of your garden, this rough sawn Picket Rounded Top Garden Fence Panel is a robust product that offers excellent value for money. This fence panel measures 5' 0" (1.50m) x 6' 0" (1.83m) (HxW). If you need to create a secure and robust fencing row in your garden, then this Feather Edge Wooden Fencing Panel is ideal. A classic design means this fencing panel will enhance the look of any garden. This pressure treated fencing panel will enhance any garden thanks to an attractive and rustic design. The height of this wooden fencing mean it is perfect for keeping your garden private. 6ft x 6ft (HxW) Waltons Vertical Feather Edge Garden Fence Panels. We supply wooden garden fencing and fence panels in a variety of styles. FREE UK Delivery. This fence panel is 5' 0" (1.50m) x 6' 0" (1.83m)(HxW) . Perfect for cordoning off vegetables patches, this Pressure Treated Waney Edge Fence Panel offers a robust build that can be used for a variety of purposes. A high build quality means this wooden panel will offer many years of reliable service. This fence panel measures 6' 0" (1.83m) x 6' 0" (1.83m)(WxH). If you want to build a fencing row in an area that suffers from harsh weather, then you need this Vertical Hit & Miss Fencing Panel. A reinforced board construction means wind passes through the fencing, leaving it standing in challenging weather conditions. The 75mm x 75mm Fencing Spike is designed to offer a strong anchor for timber posts. This fence post spike is suitable for more ground conditions and can be easily installed using a Driving Tool. This fence panel measures 5' 11" (1.80m) x 5' 11" (1.80m)(HxW). Perfect for building a charming fencing row in your back garden, this Horizontal Weave Garden Fencing offers an attractive build that has been designed to enhance any garden. Pressure treated timber helps protect this fencing against weather damage. This fence panel measures 4' 0" (1.20m) x 6' 0" (1.83m)(HxW). This Feather Edge Wooden Fencing Panel is perfect if you want to build a durable and attractive fencing row in your rear garden. Quality materials combine to create a fencing panel that will comfortably stand the test of time. This fence panel measures 5' 0" (1.50m)H x 6' 0" (1.83m)W .
Perfect for building a secure fencing row that can withstand heavy gusts of wind; this Vertical Hit & Miss Fencing Panel is a robust panel that represents excellent value for money. Quality materials combine to create a solid structure that will offer many years of service. This fence panel measures 6' 0" (1.83m) x 6' 0" (1.83m)(HxW) . This Vertical Hit & Miss Fencing Panel is ideal for building a fencing row in an area that is susceptible to heavy gusts of wind. A reinforced board construction lets wind pass through the fencing, meaning this panel can withstand harsh weather conditions. This fence panel measures 6' 0" (1.83m) x 6' 0" (1.83m) (HxW). This elegant Feather Edge Fence Panel with a curved top will look great in the garden for many years to come thanks to a hard wearing build and rustic design. This Horizontal Weave Garden Fence with an Integrated Wavy Trellis is perfect for creating a fencing row that boasts elegance and quality. We have pressure treated this wooden panel to ensure a premium quality finish that will stand the test of time. If you want to build a fencing row that can withstand heavy gusts of wind, then you will love this Vertical Hit & Miss Fencing Panel. A reinforced board construction helps by allowing wind to pass through the slats. 3ft x 6ft (HxW) Waltons Vertical Feather Edge Garden Fence Panels. We supply wooden garden fencing and fence panels in a variety of styles. FREE UK Delivery. This elegant Feather Edge Fencing Panel with a curved top is guaranteed to enhance any garden it is placed in. Quality materials combine to create a robust fencing panel that will comfortably stand the test of time. 3ft x 6ft (HxW) rough sawn Waltons Picket Flat Top Garden Fence Panels. We supply wooden garden fencing and fence panels in a variety of styles. FREE UK Delivery. If you live in an area that is prone to high gusts of wind, then this Vertical Hit & Miss fencing panel offers the ideal fencing solution. Hard wearing materials come together to form a robust panel. 3 x 6 (HxW) Waltons Pressure Treated Feather Edge Fence Panel. We supply wooden garden fencing and fence panels in a variety of styles. Create a robust and classy fencing row in your garden with this Pressure Treated Feather Edge Wooden Fencing Panel. A high standard of craftsmanship means this fencing panel represents superb value for money. This classic Feather Edge Fence Panel with a curved top is perfect for creating an attractive fencing row in your garden. Quality materials provide a robust and hard wearing fence panel, offering excellent value for money. This fence panel measures 4' 0" (1.20m) x 6' 0" (1.83m) HxW). If you want to build a fencing row in an area that is susceptible to heavy winds, then this Vertical Hit and Miss offers the perfect solution. A host of durable materials combine to create a panel that represents excellent value for money. This fence panel measures 4' 0" (1.20m) x 6' 0" (1.83m)HxW. This rough sawn Picket Garden Fence Panel offers an elegant and robust fencing option that is ideal for creating a secure border for keeping children and pets in the garden. Hard wearing materials combine to create a fencing panel that will offer countless years of service. This Feather Edge Wooden Fencing Panel offers the perfect blend of security and build quality. Perfect for creating a border in the garden that will keep pets and children out of a vegetable plot, these fencing panels are a must have. This fence panel measures 4' 0" (1.20m) x 5' 11" (1.80m) (HxW). This Convex Horizontal Weave Garden Fence with an Integrated Trellis offers the perfect blend of aesthetics and privacy without emptying the bank. A pressure treated construction means this fencing will offer many years of service. 3ft x 6ft (HxW) Waltons Vertical hit and miss wooden fence panels. We supply wooden garden fencing and fence panels in a variety of styles. FREE UK Delivery. This 6ft Feather Edge Garden Gate is the ideal finish for any garden. Match it with our feather edge fence panels, all made from quality timber. This fence panel is 4' 0" (1.20m) x 6' 0" (1.83m) (HxW). This Waney Edge Fence Panel offers a secure and private border around your garden. The timber has been pressure treated to ensure this wooden panel comfortably stands the test of time. This robust Chevron Weave Garden Fencing panel is perfect if you want to create a secure border around your garden that has the added benefit of uplifting the surrounding area. The timber used in this panel has been pressure treated to offer protection against weather damage. Hazel Hurdle Fence Panel 180x180cm (HxW). The hazel hurdle fencing panel is a natural product to mark the boundary of a property, offering security and privacy. This garden gate measures 3' 0" (0.91m) x 3' 0" (0.91m) (HxW). This rough sawn Picket Rounded Top Garden Gate is perfect for creating a welcoming entrance into a vegetable plot of garden thanks to a rustic design. This palisade gate will offer countless years of service because of a robust structure that has been built with longevity in mind. This 100mm x 100mm Drive-In Fence Post Spike is designed to make installing garden fencing quick and simple. This spike is made from high quality, galvanized steel and is suitable for use on soil. 3 x 6 (HxW) Waltons Pressure Treated Vertical Hit and Miss Fence Panel. We supply wooden garden fencing and fence panels in a variety of styles. This Horizontal Weave Garden Fence with an Integrated Wavy Trellis is the perfect way to add some elegance to your garden fencing project. A pressure treated construction helps defend this wooden fencing against wood rot and decay. This garden gate measures 3' 0" (0.91m) x 4' 0" (1.20m) (WxH). This wooden rough sawn Picket Flat Top Garden Gate is perfect for creating a warm and welcoming entrance into your garden or allotment. Premium quality materials combine to create a robust garden gate that will offer many years of service. This garden gate is 2' 11" (0.91m) x 6' 0" (1.83m) (HxW) . This 6ft Waney Edge Gate offers is the perfect way to finish off a garden fencing project. Robust materials combine to create a practical and welcoming garden gate that will offer many years of service. This 5ft x 3ft (HxW) Feather Edge Garden Gate is the ideal finish for any garden. Match it with our feather edge fence panels, all made from robust materials. 5'11 x 5'11 Waltons Pressure Treated Diamond Trellis Fencing. We supply wooden garden fencing and fence panels in a variety of styles. This fence panel measures 5' 11" (1.80m) x 5' 11" (1.80m). This Convex Weave Garden Fence with an Integrated Trellis is essential for creating a secure fencing row in your garden that also adds a decorative touch. Pressure treated timber ensures this wooden panel will offer countless years of service. Hazel Hurdle Fence Panel 180x90cm. The hazel hurdle fencing panel is a natural product that marks the boundary of a property, offering privacy and security. This fence panel measures 5' 0" (1.50m) x 5' 11" (1.80m) (HxW). This Concave Horizontal Weave Garden Fence with an Integrated Trellis offers the perfect blend of classic aesthetics and value for money. The timber has been pressure treated to ensure this fencing offers many years of service. This 1.8x4m eco-friendly willow fence screening is perfect to add extra privacy and a touch of decoration to your outdoor areas. This fence panel measures 4' 0" (1.20m) x 6' 0" (1.83m) (HxW). This rough sawn Picket Rounded Top Garden Fence Panel is ideal for creating a rustic and secure fencing row around the edge of your back garden. Pressure treated timber provides our best protection against weather damage. 3ft x 6ft (HxW) rough sawn Pressure Treated Round Top Picket Fence Panel. We supply wooden garden fencing and fence panels in a variety of styles. FREE UK Delivery. This garden gate is 2' 11" (0.91m) x 5' 0" (1.50m) (WxH). This 5ft Waney Edge Gate is the perfect way to create a welcoming entrance into your garden or vegetable patch. The attractive and rustic nature of this wooden gate means it is perfect for completing a fencing project. Hazel Hurdle Fence Panel 180x120cm. The hazel hurdle fencing panel is a natural product that marks the boundary of a property, offering security and privacy. Hazel Hurdle Fence Panel 180x150cm. The hazel hurdle fencing panel is a natural product to mark the boundary of a property, offering privacy and security. Our 75mm x 75mm Bolt Down Fence Post Shoe allows you to install a fence post onto decking or a concrete base with ease. This 4ft x 3ft (HxW) Feather Edge Garden Gate is the ideal finish for any garden. Match it with our feather edge fence panels or install it as a stand alone feature. This fence panel measures 4' 0" (1.20m) x 5' 11" (1.80m)(HxW). This Chevron Weave Garden Fence is perfect for creating a fencing row that will enhance the appearance of your garden. Pressure treated timber means this fence panel will comfortably stand the test of time. Hazel Hurdle Fence Panel 180x137cm. The hazel hurdle fencing panel is a natural product that marks the boundary of a property, offering privacy and security. This 1.5x4m eco-friendly willow fence screening is perfect to add extra privacy to your outdoor areas. This 2x4m eco-friendly willow fence screening is perfect to add extra privacy and a touch of decoration to your outdoor areas. Create beautiful borders or your very own private seating area in your garden with these natural Willow Fence Panels. The ethically sourced willow is woven together to create a strong fence panel that is well suited to any garden environment. This rough sawn Picket Garden Gate is perfect for creating a warm and welcoming entrance to a garden feature because of the classic aesthetics. Premium quality materials combine to form a palisade gate that will offer many years of reliable service. This rough sawn wooden Picket Flat Top Garden Gate is perfect for creating a warm and welcoming entrance into your garden or allotment. Premium quality materials combine to create a robust garden gate that will offer many years of service. This 1.2x4m eco-friendly willow fence screening is perfect to add extra privacy and a touch of decoration to your outdoor areas. This garden gate is 2' 11" (0.91m) x 4' 0" (1.20m) (WxH). This Waney Edge Gate is the ideal garden accessory for completing a fencing row. Our wooden garden gate will enhance any garden and will match our Waney Edge fence panels perfectly. Our Bunched Willow Fence Panels will transform your garden! The elegant bunched weave design provides a solid fence panel that complements any style of garden, from a small urban courtyard or a large country garden. The 75mm x 75mm Bolt Down Fence Post Shoe is designed so installing fencing on an existing hard surface like concrete or a wooden base. Installing fence post onto decking or a concrete base may seem difficult but with a post shoe it can be simple and quick. Liven up an urban garden with this beautifully woven willow fence panel that is eco-friendly. The natural and rustic look is perfect for buyers who want to transform the look of their gardens. This fence panel measures 5' 3" (1.60m) x 5' 11" (1.80m). Perfect for creating an attractive and robust fencing row around the edge of your garden, this Horizontal Weave Garden Fence with an Wavy Trellis boasts charming features that make it a must have. Pressure treated timber prolongs the life of this good looking fence panel. This 75mm x 75mm Fence Post Flush Bolt Shoe is designed to make installing your garden fencing quick and simple. This Flush Fit Bolt Down Shoe is suitable for installations where a post requires fitting against a flush surface. Bring a part of the country side to your own garden with this beautifully woven willow fence panel. The traditional design is ideal for buyers who want to create a natural look in their garden that is eco-friendly. This garden gate measures 2' 7" (0.80m) x 6' 0" (1.83m). This traditional Feather Edge Gate is ideal for creating a private entrance into your garden or allotment. Boasting pressure treated timber, this wooden gate has been designed to offer many years of reliable service. The Powapost Concrete In Post Shoe is designed to help you install your garden fencing easily and quickly. This post shoe is designed to be set into concrete so it can act as an anchor for timber fence posts. This garden gate measures 3' 0" (0.91m) x 4' 0" (1.20m). This Picket Garden Gate with rounded tops is a robust and attractive garden accessory that looks great in the garden. The rough sawn timber has been pressure treated to ensure this gate offers countless years of service. These willow fence panels make the ideal border for you to create a sitting area in their garden. The high quality willow is woven together to create a sturdy fence panel that is perfect for your garden. The 100mm x 100mm Bolt Down Fence Post Shoe is designed so installing fencing on an existing hard surface like concrete or a wooden base. This post shoe makes installing new garden fencing simple and is easy to use. This garden gate measures 2' 7" (0.80m) x 5' 0" (1.50m). This charming Feather Edge Gate is perfect for adding the finishing touch to a garden fencing project. Pressure treated timber means this wooden gate is guaranteed to offer many years of reliable service. Woven from natural willow this Twin Pack of Willow Borders will create a natural and unique border to surround lawns, flowerbeds and pathways. This 3ft Feather Edge Garden Gate creates the perfect entrance to any garden and is made to match our feather edge fence panels. These 6ft x 4.5ft (HxW) willow fence panels are perfect for keen gardeners who want to transform their gardens. The ethically sourced willow is woven together to create a strong and attractive fence panel that will add the finishing touches to any garden. This garden gate is 2' 11" (0.91m) x 2'7'' (0.79m). This 3ft Waney Edge Gate is perfect for adding the finishing touch to any garden thanks to a rustic design and robust build. If you have recently bought some of our Waney Edge fence panels, then this wooden gate will match up perfectly. The Powapost Repair Spike is post shoe designed to provide a quick and easy solution to a broken or rotted timber fence posts. The 100mm Powapost Repair Spike is a special post shoe designed to provide a quick and easy solution to broken or rotted timber fence posts. Fence posts set into the ground can easily rot or break due to weather and ground conditions. This repair spike is easy to use and will save you time and hassle. This garden gate is 2' 7" (0.80m) x 6' 0" (1.83m). Ideal for creating a secure entrance into a paddock or allotment, this Pressure Treated Waney Edge Gate offers the perfect mix of build quality and value for money. High quality preservative helps to create a durable wooden gate. The 75mm x 75mm Concrete In Post Shoe is designed to help you install your garden fencing easily and quickly. This post shoe is designed to be set into concrete so it can act as an anchor for timber fence posts. Create a little shelter for your garden seating area, with our stylish Bunched Willow Fence panels. The elegant bunched weave design provides a solid panel that will add structure to the landscape of your garden. These 6ft x 3ft bunched willow fence panels are the perfect way to bring textures to your garden. The bunched weave design provides a strong fence panel that will look great in any style of garden. This garden gate measures 3' 0" (0.91m) x 3' 0" (0.91m). Perfect for finishing off a picket fencing row project, this charming rough sawn Picket Rounded Top Garden Gate offers a secure and robust option that represents superb value for money. This gate has been pressure treated to ensure a long lasting finish. A hassle free way of installing fence supports, this 75mm x 75mm PowaPost Driving Tool is ideal for use in a 100mm x 100mm drive in post spike. It protects the post support when being hammered into the ground and assists with achieving the correct alignment. Pressure Treated Square Chevron 6ft x 3ft (HxW) Gate will add more practicality and detail to your fence panels. Installing fence supports is made easy using this 50mm x 50mm PowaPost Driving Tool. Ideal for use in a 75mm x 75mm drive in post spike, it will ensure the fence supports maintain the correct alignment and providing protection as they are hammered into the ground, the aid of this driving tool is sure to have your garden fencing complete and looking great in no time. This 75mm Powapost Fence Post Extender is designed to help you add height to existing fence posts so you can add decorative panels. This post extender is easy to use and hassle free. This garden gate is 3' 0" (0.91m) x 5' 0" (1.52m). Mixing a blend of modern build quality with traditional rustic looks, this 5ft Pressure Treated Waney Edge gate is perfect for creating an entrance into your garden. This wooden gate has been pressure treated to create a long lasting finish. This Picket Garden Gate is perfect for creating a warm and welcoming entrance to a garden feature because of the classic aesthetics. Rough sawn timber creates a palisade gate that will offer many years of reliable service. This garden gate is 2' 7" (0.80m) x 3' 0" (0.90m). This pressure treated Waney Edge Gate is perfect for adding the final finish to a fencing project because of the charming aesthetics. The high level of craftsmanship makes this wooden garden gate superb value for money. This fence panel measures 3' 0" (0.91m) x 6' 0" (1.83m). 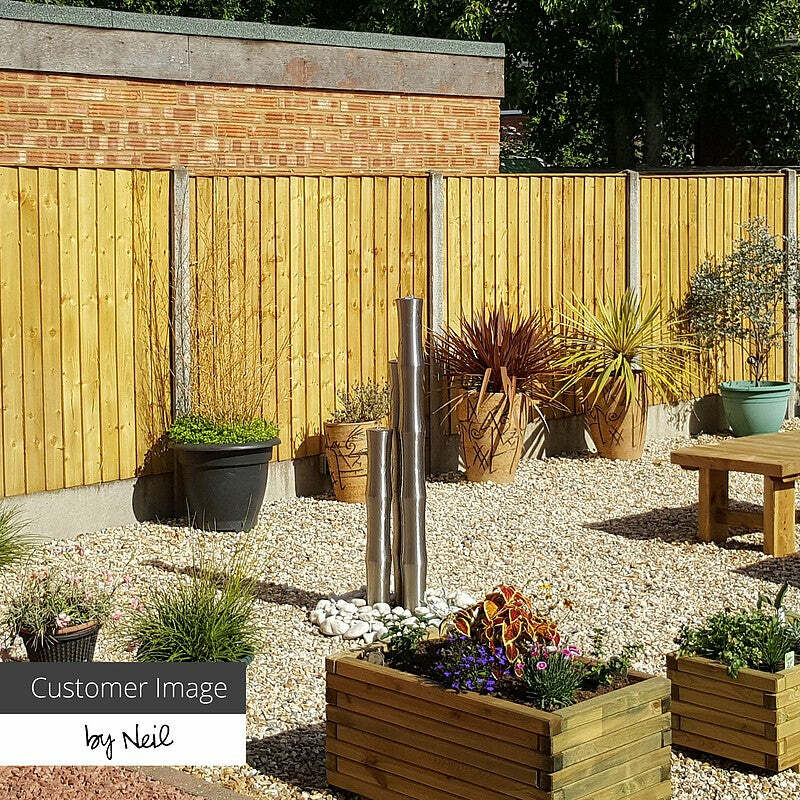 This wooden rough sawn Picket Flat Top Garden Fence Panel is ideal for creating a secure border around the garden that won’t block out natural light. Pressure treated timber ensures this fencing will offer many years of service. This rough sawn Picket Flat Top Garden Gate is the perfect garden accessory to complement your fencing project thanks to charming aesthetics. Made from pressure treated timber, this wooden gate will offer countless years of service. This garden gate is 2' 7" (0.80m) x 4' 0" (1.20m). If you are looking to add the finishing touch to a garden fencing project, then look no further than this Waney Edge Gate. The pressure treatment means this wooden gate will offer many years of reliable service. This fence panel measures 4' 0" (1.20m) x 6' 0" (1.83m). This rough sawn Picket Garden Fence Panel is perfect for building a welcoming fencing row in the front garden for visiting guests. Pressure treated timber offers our best protection against weather damage. Not too sure what type of fencing panels would suit your garden? Our buying guide is here to help you decide which is best for you.